Registration Includes: 2 CPR certification wallet cards, An official certificate, a 2 year subscription to our online Animal Emergency Resource Center, your choice of the 88 page full color class manual either as an Ebook (View Only/Cannot be Printed) or a printed copy (additional $24.95), businesses, organizations and groups may request a professional, frameable certificate and window decal, to hang in their place of business to promote that their staff/members are certified. Our program is based on the most current method of animal CPR which was developed by emergency veterinarians. 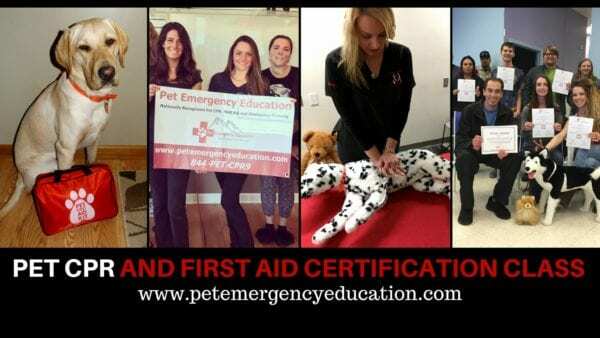 This class is designed to teach the average person how to administer emergency CPR and first aid to an animal until veterinary care is ascertained. This class is not a replacement for veterinary care. Classes are approved to award continuing education credits to veterinary support staff, members of CCPDT, IAABC, NADOI IACP, PACCC and Pet Sitters International.